Shrimp, Avocado and Hummus Quesadillas | Healthy. Delicious. Today is one of my favorite food holidays – National Hummus Day! I eat hummus with pita chips (or beer-rye crackers!) all the time, but a whole day devoted to hummus deserves something more adventurous. Last year’s spicy chipotle hummus pasta was a huge hit, so I was really feeling the pressure to come up with something creative. 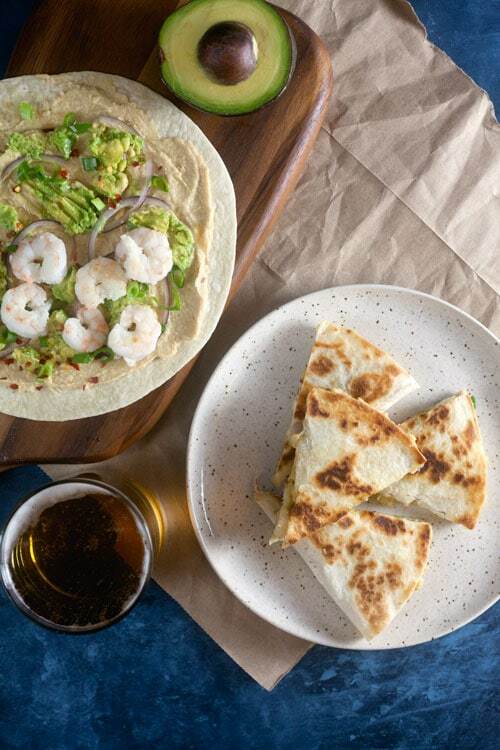 These delicious shrimp, avocado, and hummus quesadillas definitely fit the bill! They’re crispy, creamy, salty, spicy – and perfect with a cold glass of beer. They’re also simple to make (it’s almost a stretch to call this a recipe) and work equally well as a snack or a light meal. 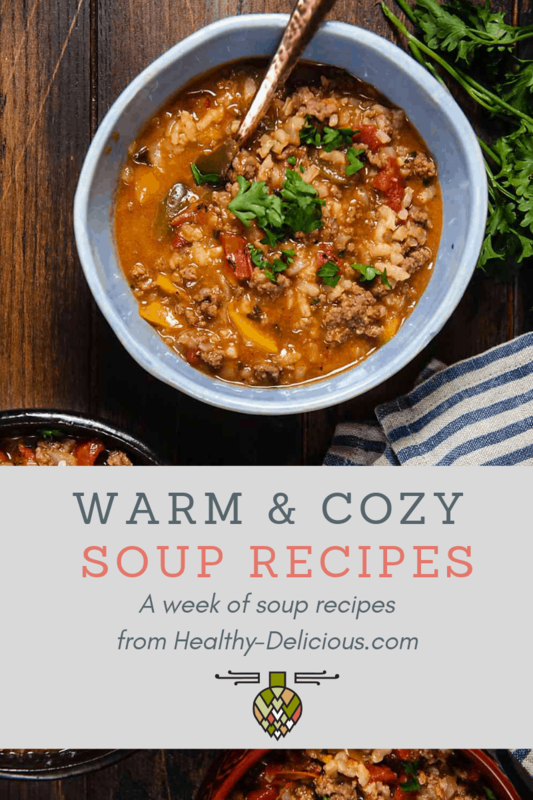 It’s the kind of recipe you’ll find yourself making over and over again. Head over to Sabra.com for a coupon (available today only, so get it while it’s hot!) 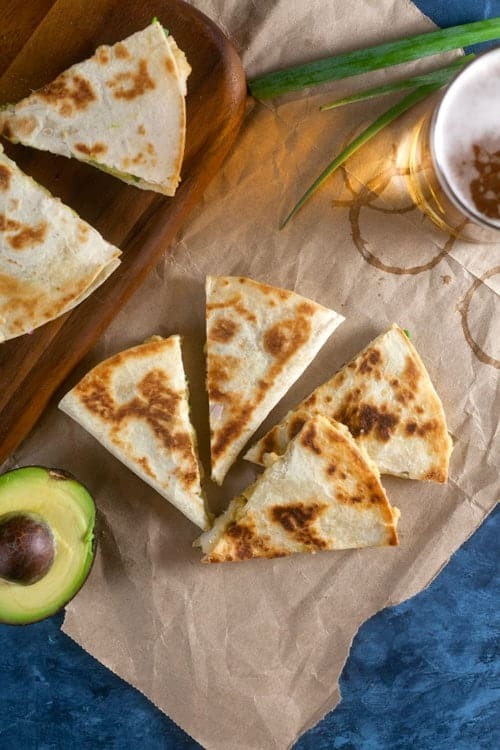 and celebrate with these quesadillas tonight! 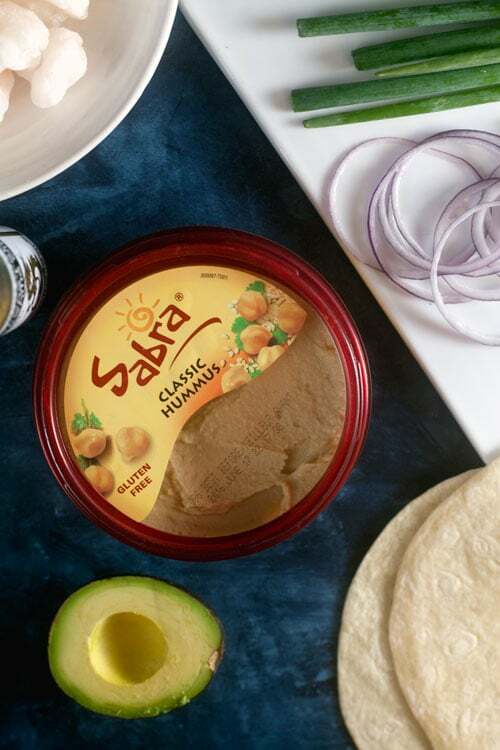 Calling these “quesadillas” isn’t exactly accurate since there isn’t any cheese in them, but Sabra’s classic hummus gives them a similar creaminess. They’re a great alternative for people who can’t eat dairy, but they’re also a huge hit with people who can. 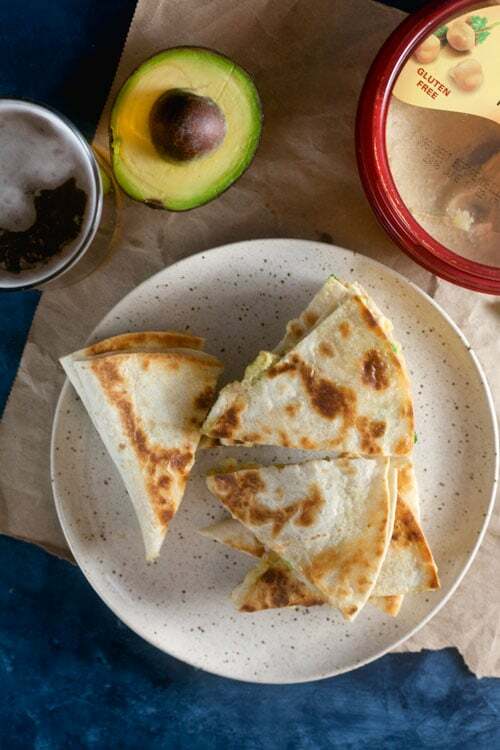 A drizzle of toasted sesame oil takes the flavor of these hummus quesadillas completely over the top. It helps bring out the sesame flavor of the tahini (sesame paste) that’s in the hummus, while also giving them a subtle and unexpected Asian twist. Cook the shrimp in a skillet set over high heat until just cooked through, about 3 minutes. Spread each tortilla with 2 tablespoons of hummus, leaving a 1/2-inch border around the edge. Drizzle with toasted sesame oil. Scatter the avocado over the hummus. Use a fork to gently mash the avocado. Arrange the cooked shrimp, red onion, and scallions over half of each tortilla. Sprinkle with red pepper flakes. Fold the tortillas in half. Heat the olive oil in a skillet over medium-high heat. Add the quesadillas and cook 3-4 minutes on each side, or until golden brown and lightly crisp. 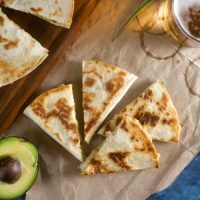 Cut each quesadilla into 4 wedges and server immediately. YUM! Quesadillas are the BEST! 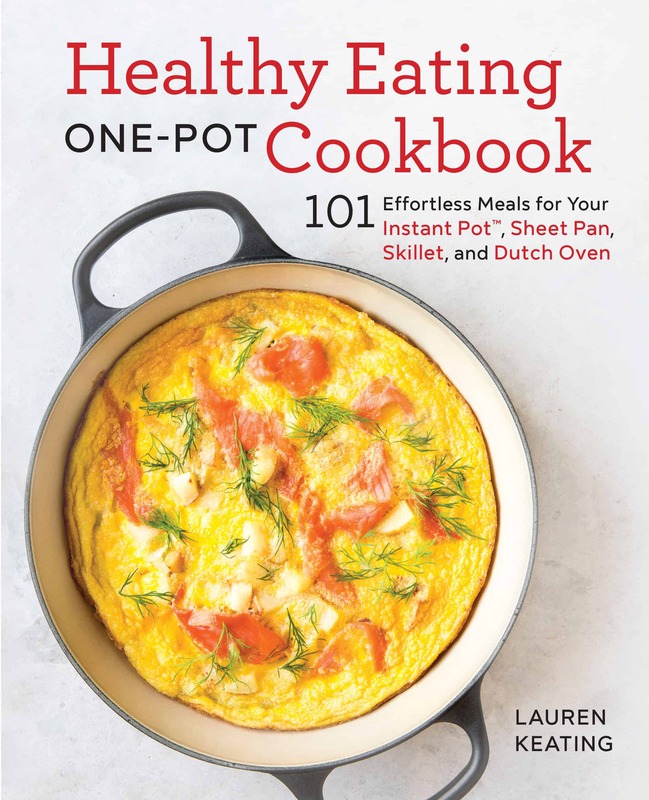 Love the addition of hummus in here.